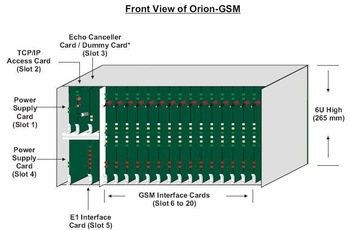 Orion Telecom Networks Inc, offers E1 GSM Gateway / GSM Channel Bank / GSM Multiplexer integrates the WAN E1 interface to the GSM mobile communications network. Orion’s E1 GSM Gateway / E1 GSM Channel Bank is a compact wireless solution, which integrates the E1 interface to the GSM (wireless) network to provide the USER with 30, GSM (mobile) wireless links for mobile communications with an integrated E1 Interface. Also offers T1 GSM Gateway / T1 GSM Channel Bank. The GSM equipment is available with 900/1800MHz, 900/1900MHz and 850/1900MHz combinations. The interface of the Network Side is E1 Digital Interface with CAS R2 Signaling. The interface on the USER Side is 30 x GSM Wireless links. Ideal choice for terminating long distance traffic / VoIP traffic to the PSTN / GSM (mobile cellular) networks. No LAND LINES REQUIRED!!! Remote monitoring and configuration through TCP/IP access. PRI ISDN (EURO ISDN) Signaling (Optional). Dual Band GSM 900/1900 MHz. Dual Band GSM 850/1900 MHz. Improved voice quality. The two wire trans-hybrid analog path (present in the Fixed Wireless terminals) is eliminated in the Orion’s GSM design resulting in improved voice quality, clearer voice and superior channel separation by reducing the susceptibility to echoes that result from the analog two wire trans-hybrid VF paths. Disable caller ID. Orion’s GSM terminal can be programmed (default factory setting) to block caller ID presentation. Provides accurate billing information (“answer supervision” and “line disconnect supervision”) – not provided by Nokia Fixed Wireless Terminals and optional in Telular Fixed Wireless Terminals. Provides an “on-line” tone while the GSM Interface dials into the network (local number) to indicate to the CALLING PARTY that the line is connecting. Integrated 64ms E1, Echo-Canceller to eliminate any echoes arising out of network delays. 128ms echo canceller – optional extra. Lower cost – resulting from complete, GSM wireless to E1 integration. Plug-And-Play. Easy to install. Takes only minutes to install and start service.